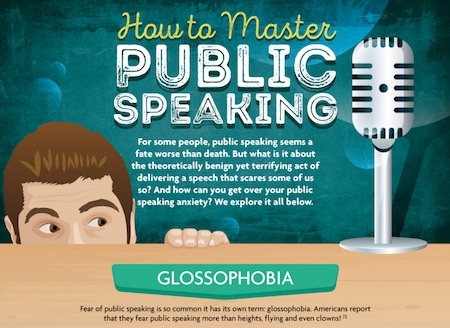 Lydia Bailey, content coordinator of Masters Programs Guide, has shared with us a handy graphic that pulls into one place many useful insights in dealing with the fear of public speaking. (Full graphic at the end of this post.) The web site in general aims to help people find the right master’s degree program for their goals and interests. Such folks have an interest in effective public speaking–not will they do a lot of it, but many academic folks assume they do not really need to be effective at public speaking (their brilliance will obviate the need for effective delivery). In that setting with those assumptions, it’s not too hard to stand out as a breath of fresh air. I want to temper their recommendation to memorize the opening lines of your speech. Yes, starting is often the hardest part, and I agree with them, with a caveat. The opening and the closing are arguably the most important parts of the presentation because of the principle of primacy and recency (people remember most clearly the first thing and the last thing they hear). If the opening is stilted, you start off with a bad impression. A memorized opening can sound stilted because people don’t talk the way they write–and for most people, memorizing starts with writing. Here’s how I agree about 90% with that “memorize the opening” advice: Although your introduction and conclusion together may only constitute 10 or 15 percent of the whole presentation, a lot of professionals spend half their prep time on the introduction and conclusion. Get really familiar with what you want to say. Rehearse. Polish the opening and the closing. In effect, you will wind up memorizing it in the sense that it will eventually come out the same way every time you practice it. But it’s not sufficient to write out, for instance, the first 100 words of your speech and then memorize the words. You need spoken instead of written out loud. They have solid advice on solutions to common problems, and their analysis of the roots of communication anxiety are spot on. In any case, this is a useful infographic, worth considering for anyone who needs to address an audience–especially an academic one. Here’s the full infographic–but check out their site for guidance to master’s programs and other content on public speaking!